Replacing lost or missing teeth can have substantial benefits for your health, appearance and lifestyle. Freedom Dental use dentures to fill the gaps left by missing teeth, dentures are removable false teeth made of acrylic (plastic) or metal. They fit snugly over the gums to replace missing teeth and eliminate potential problems caused by gaps. Gaps left by missing teeth can cause problems with eating and speech, and teeth either side of the gap may grow into the space at an angle. Sometimes all the teeth need to be removed and replaced. Complete Dentures: A full set which replace all your upper or lower teeth. Partial Dentures: Which replace just one or a few missing teeth. Dentures can help prevent these problems and, if complete dentures are needed, can improve the appearance of your smile, fill out your face and give you confidence. A full denture will be fitted if all your upper or lower teeth need to be removed or you are having an old complete denture replaced. The denture is usually fitted as soon as your teeth are removed, which means you won't ever be without teeth. 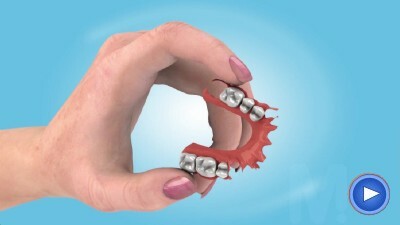 The denture fits snugly over your gums and jawbone. Occasionally, however, your gums may need to heal for several months before dentures can be fitted. At Freedom Dental we will take measurements and impressions (moulds) of your mouth, we then order your full or partial dentures from our dental technician. A trial denture will be created from the impressions that are taken of your mouth. The dentist will try this in your mouth to assess the fit and for you to assess the appearance. The colour and shape may be adjusted before the final denture is produced. A partial denture is designed to fill the gaps left by one or more missing teeth. It is either a plastic or metal plate with a number of false teeth attached to it, which then clips onto some of your natural teeth via metal clasps, which hold it securely in place in your mouth. It can easily be unclipped and removed for cleaning. At first you may need to wear your dentures all the time, including while sleeping. Your dentist at Freedom Dental will advise you as to whether you should remove your dentures before you go to sleep. It is not always necessary to remove your dentures at night, but doing so can allow your gums to rest as you sleep. If you do remove them, they should be kept moist – for example, in water or a polythene bag with some dampened cotton wool in it, or in a suitable overnight denture cleaning solution – to stop the denture material from drying out and altering in shape. It's important to regularly remove plaque and food deposits from your dentures, as unclean dentures can also lead to problems such as bad breath, gum disease, tooth decay and oral thrush. Clean your dentures as often as you would normal teeth (at least every morning and night), brushing them with paste or soap and water before soaking to remove food particles . To remove stains and bacteria use a denture-cleaning tablet to soak the dentures. Dentures may break if you drop them, so you should clean them over a bowl or sink filled with water, or something soft such as a folded towel. When you first start wearing dentures you should eat soft foods cut into small pieces and chew slowly using both sides of your mouth. Avoid chewing gum and any food that is sticky, hard or sharp-edged. For more information about registering with us as an NHS patient or for more information on Dentures please call Freedom Dental on 0161 486 6821. Alternatively you can send an email or simply fill out the form on this page.